One afternoon last February, my daughter Karuna’s eyes started going wild. Her pupils would get stuck at the sides of her eyes, and every time she tried to fix them, they would bounce right back into the corners of her eyes. At times, they would just wiggle back and forth in a classic horizontal nystagmus, though always to the left. Even her head would tic along with the movement of her eyes. While my daughter is significantly visually impaired, we had never seen anything like this. At first we thought it might be a seizure. We gave her several doses of seizure rescue medication, which did manage to stop the movements once she fell asleep. But as soon as she woke up, the eye and head movements began again. The next day she had eye movements not only to the left, but also to the right. What on earth was this? And how could weird eye movements end up as hearing loss? It turned out she had a rare condition called labyrinthitis. We immediately sent video of her to her neurologist, who suspected a vestibular disorder based on the eye movements. The vestibular apparatus in the body controls balance and helps you know where you are in space. The labyrinth of the inner ear, which is made up of the cochlea, semicircular canals, and several smaller parts, is the apparatus responsible for vestibular function. If for some reason the labyrinths are damaged, the result is a vestibular disorder or dysfunction. There are several different vestibular disorders, including vestibular neuritis, labyrinthitis, and benign paroxysmal positional vertigo. All have similar vestibular symptoms, including dizziness, vertigo, nausea, and sometimes eye movements like nystagmus. Eye movements may occur because the eyes are vital for sensing balance and movement. When the head moves, even a tiny bit, the fluid in the inner ears moves as well. Signals based on this fluid movement are sent to the brain in what is called the vestibulo-ocular reflex. These signals then help the eyes focus appropriately during even the smallest head movement. If the signals sent from the inner ears are faulty or are not occurring, the brain and eyes may have difficulty sensing balance and location in space, which results in eye movements like nystagmus. Once we determined Karuna had some sort of vestibular dysfunction, we attempted to determine which type. We had several important clues: she was fighting a virus that gave both her siblings ear infections, and it appeared she was not hearing. After performing a few informal hearing tests, most involving dropping large objects on the floor while she looked away, we determined that she had absolutely no hearing in either ear. The diagnosis was labyrinthitis, an inflammation of the inner ears. It is typically caused by an upper respiratory virus and is usually only seen in adults. Children and some adults may develop labyrinthitis after having a bacterial ear infection. Less commonly, it may be caused by meningitis or autoimmune disease. In Karuna’s case, she had an upper respiratory virus that was the likely cause. While she never had an ear infection, she did have some fluid in her ears. Karuna also has autoimmune disease that may have made her more prone to this condition. In general, labyrinthitis is a self-limited condition that disappears on its own in several weeks or months. 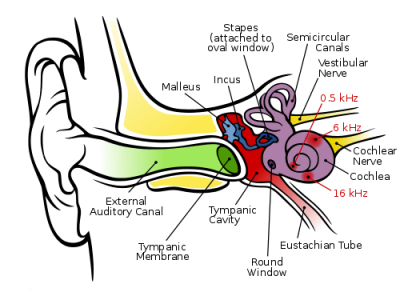 There are typically three phases: the acute phase, in which temporary hearing loss occurs, a symptomatic period for about two weeks during which hearing returns, and a recovery period, which may last weeks or months, and is characterized by both improvement in the vestibular dysfunction and increased compensation for any remaining vestibular dysfunction. Karuna’s case was somewhat unusual in that it affected both ears and she continued to have hearing loss for many months after her episode of acute labyrinthitis. In addition, every time she had even the slightest cold or congestion, her ears would fill with fluid and trigger her vestibular symptoms again, while also making her hearing even worse. Vestibular symptoms of labyrinthitis can be managed to some degree. Medications are used primarily for symptomatic relief, such as sedatives to reduce dizziness or anti-nausea medications to eliminate vomiting or nausea. Physical therapy or vestibular therapy can help children and adults learn to compensate for their vestibular dysfunction. In Karuna’s case, she was first prescribed antibiotics, just to make sure there was no underlying bacterial infection. After that, she received Valium and an increased dose of Baclofen, which is known to improve vestibular disorders. Her constant nystagmus disappeared within two weeks, and her hearing started coming back within a week. Nevertheless, she continued to have positional nystagmus, especially with head turns, and her symptoms increased dramatically whenever she had fluid in her ears. Unfortunately, Karuna continued to have fluid in her ears over the following six months. Her right ear never cleared of fluid, and her left ear only cleared briefly. Due to the fluid in her ears, she had a severe conductive hearing loss in both ears. In addition, otoacoustic emission testing of her ears suggested she might have high frequency sensorineural hearing loss as well, due to permanent damage to her inner ears from the inflammation of her labyrinths. Ultimately, Karuna had tubes placed in both ears to keep them fluid-free. The tubes eliminated her conductive hearing loss, but testing continues to indicate she has severe permanent high frequency loss due to labyrinthitis. While permanent hearing loss is unusual, it is a possible effect of this disorder. While Karuna continues to have nystagmus and vestibular symptoms eight months after her acute labyrinthitis, her doctors are still hopeful that her vestibular symptoms will eventually disappear. She has learned to compensate for many of the symptoms by turning her head or averting her eyes. Even when they do occur, she can usually get them under control pretty quickly through compensatory behaviors. We usually only see her symptoms when she is tired or stressed, and most often just with head turns. Her hearing loss, however, is permanent. Her left ear is more mildly affected, and can hear low and medium frequencies, including most speech. Her right ear can only hear low and low-medium frequencies. Her hearing is reasonably functional under ideal circumstances when there is little background noise. She will be receiving hearing aids in the next few months to help maximize her hearing. While uncommon, it is possible to lose hearing permanently from labyrinthitis. The diagnosis should be considered in any child with hearing loss and vestibular symptoms. Author: Susan Agrawal • Date: 10/17/2011 • Image by Inductiveload [CC-BY-SA-2.5 (www.creativecommons.org/licenses/by-sa/2.5)], via Wikimedia Commons.